FOR more than a week the people of Haiti have been trying to cope with the pain and suffering caused by a devastating earthquake. As often in such circumstances, local Salvation Army personnel were immediately on hand to assist people, despite experiencing agonies, bereavements and losses of their own. The more than 700 Salvation Army workers are now being supported by international team members who have experience of working in disaster relief situations. The international personnel deployed to the scene are based in the capital, Port-au-Prince, at The Salvation Army compound in St Martin. Lieut-Colonel Lindsay Rowe (Chief Secretary, Caribbean Territory) says the area The Salvation Army is working in is considered to be one of the most dangerous in Port-au-Prince. 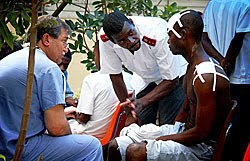 For security reasons the press have been warned by local authorities to keep clear but this has meant that The Salvation Army has had little coverage in the international media reports from Haiti. The Salvation Army has had a ministry in St Martin for 60 years and the movement is well respected and appreciated. The compound includes administration buildings, worship halls, a school, children’s home, a feeding programme and a medical clinic. Many of the buildings were badly damaged and some rendered completely unusable by the earthquake. Nevertheless, the area is being well used to coordinate the emergency response, food distribution, medical services and general care and support of local people. Beyond the exchange between existing territories, there is a growing commitment to pioneering mission within formerly assisted and receiving territories. The Korea Territory, for example, has for some time been exploring the possibilities for mission in Outer Mongolia. During the Centenary Congress in Seoul in September 2008, a Korean officer couple was appointed to formally establish the Army's work in Ulan Bator, Mongolia. Earlier, the Korea Territory launched, staffed and fully supported the Army's work in Vladivostok. There are many strengths in the Army's internationalism: a bracing sense of international camaraderie, of participation in a global movement marching under the same banner of Blood and Fire. Internationalism affords a capacity for rapid mobilization, maintenance of standards, efficiencies in fiscal management, the sharing of resources and expertise, and capacity for strategic response to emerging opportunities for service, to name but a few. The Army's response to the open door for our return to Russia in the wake of the dramatic demise of the Soviet Union is an example. Mobilizing our global response to the devastating 2004 Tsunami in South Asia, is another. At its best the Army's internationalism models the Body of Christ in both its unity and rich diversity. International Headquarters this year released a revision of the 2002 publication, Servants Together: Salvationist Perspectives on Ministry. Significantly, the cover art features a painting by Salvationist Mikhail Gavrilov, one of the first lay leaders to emerge after the Army's return to Russia in 1991. The image of Christ is made up of figures representing the diversity within the community of believers. Facing the immense challenges in mission and the doors of opportunity opening to his expanding work, General William Booth called for a growing Army, "a stupendous force" all under one head, marching under the same flag. Growth was a priority and remains so in bringing the movement to what I have elsewhere called ''full battle strength." The challenge to attain a million marching into the new millennium -- adult 'soldiers,' a covenanted cadre of the committed, was achieved and announced amid great rejoicing at the 2000 International Congress in Atlanta GA. In exploring the Army's church growth potential it became evident that the will to grow would be determined by the Army's self-understanding as an authentic and vital expression of the Church of Jesus Christ. It was necessary therefore to establish the theological and biblical legitimacy of the Army model of churchly life and mission. Institutional advance is one thing. Authentic growth of the Body of Christ, quite another: growing up "into him who is the head, that is Christ, . . . . the whole body, joined and held together by every supporting ligament, [growing] and [building] itself up in love, as each part does its work" (Ephesians 4:15-16). Ÿ claim the promise of the Spirit's life and the Savior's lordship over and within the Body, which is his Church. In this way we begin to understand fully the dynamics and necessities of growth in the living organism, which is the Body of Christ, Jesus Christ himself the Head "from whom the whole body, supported and held together by its ligaments and sinews grows as God causes it to grow" (Colossians 2:19). Traditionally, the Army has avoided using ecclesiastical terminology as being more hindrance than help. And, incidentally, one notes the emergence of worship centers, temples and tabernacles among seeker-sensitive new church plants, assiduously avoiding the term 'church' at least in their signage. One can appreciate the sensitivities of Booth's early militants who did not want to be identified either with the staid institutionalism of the Anglican Establishment or with the sectarian squabbles of the nonconforming churches and chapels in Victorian England. Their concern was for demonstrating the reality of the Church and fulfilling its mission. They considered themselves above denominationalism, or 'sectarianism' [which the Army Mother, Catherine Booth, was given to denigrating in the most scathing terms!]. They were intent on being the Church rather than talking about it. Beginning with the publication of Commissioner Needham's Community in Mission: a Salvationist Ecclesiology in 1987, the first book length theological reflection on the Army's relationship to the New Testament ideal of the church, the Army has been ineluctably drawn toward an increased understanding and acceptance of its ecclesial identity and function and their implications for the life and ministry of the movement. This is clearly evident in the new Handbook of Doctrine, Salvation Story, to which reference has been made. Chapter ten, in this volume, for the first time in our history articulates a doctrine of the Church. Earlier editions made reference to the Church Universal but not to the Army as a church embodying the New Testament ideal of the church in community and mission. In recent years, and for a variety of reasons, we have begun to come more to terms with our churchly identity -- that is, the accepted and publicly-acknowledged fact that we are the church home for something upwards of two million people in the world. For most of them we are their primary, if not only, point of insertion into the body of Christ. We are the fellowship within which they experience their connectedness with the body of Christ. It is the Army through its corps life that provides them with essential instruction in Christian doctrine and an understanding of the truth of Scripture. It is the Army that provides the primary setting for worship for most of our people. What they know of personal spiritual discipline, they learned from us. It is through the Army they experience their relationship to the broader Christian community and establish their identity within that community as bona fide Christian believers. Simply put, it is time for us to take more seriously issues related to our inner life. We owe it to our people. It is essential to maintaining the engine of commitment and passion. Our mission is energized by our spirituality. We have a responsibility to ensure that we are not denying our people necessary means of grace and that their participation in the life of the Army through their local corps affords them every available advantage in living the Christian life." 'To grow saints' and 'To serve suffering humanity'. The message of the Army wherever it is preached is grounded firmly in Biblical truth and evangelical faith. It is spoken and sung in 175 languages by Salvationists. The modes and metaphors of expression and the idioms and instruments of Army music-making are delightfully diverse, but the message is the same. It is a positive Gospel of possibility, of purity, and power. It is a transformational Gospel grounded in the redemptive work of Christ on the Cross, the reality of the Resurrection and the promised presence and power of the Holy Spirit. We believe in a salvation from sin and from sinning. We believe in a Gospel that can open blinded eyes and turn the most desperate soul from 'darkness to light, and from the power of Satan to God, so that they may receive forgiveness of sins and a place among those who are sanctified by faith in [Christ Jesus]' (Acts 26:17-18 TNIV). Given the founders early immersion in Wesleyan theology, it is not surprising that Army doctrine is Wesleyan in orientation ['There is one God and John Wesley is his prophet!']. A brief statement of eleven salient points was formulated to under gird the evangelical mission of the Army. The 'doctrines' were not intended to be comprehensive. They have been explicated and expanded in subsequent versions of the Army's Handbook of Doctrine, the most recent of which was published in 1998 with the title, Salvation Story: Salvationist Handbook of Doctrine. The current Handbook includes the classical creeds: the Apostles Creed, the Nicene Creed and the Athanasian Creed. It is not a weighty theological tome, but offers a clear and concise guide for an Army on the march, capable of translation into languages around the world. Brief in compass it reflects extensive theological reflection and broad biblical understanding. Commissioner Gudrun Lydholm, M.Th., served with distinction on the International Doctrine Council which produced the fresh rewriting of the Handbook. In 2005 she published a review of the development of the new Handbook in Word & Deed, A Journal of Salvation Army Theology and Ministry. Particularly helpful is her comparison of the 11 doctrines with fresh summaries and rewordings which appeared at the end of each chapter in Salvation Story. These supplied additional emphases that had not been referenced in the traditional doctrines, probably being assumed by the early Army missioners. They included references to the birth and resurrection of Jesus and his return in glory and a separate reference to the person and work of the Holy Spirit. At the heart of the Army's mission is the firm confidence that the Gospel of Christ is still "the power of God that brings salvation to everyone who believes" (Romans 1:16 TNIV). Cultural adaptation has been a hallmark of the Army from the first. In a remarkable document addressed to his growing force of missioners in India dated 27 August 1886, William Booth urged Tucker's cadre to explore every reasonable means for relating to the culture and communicating the essentials of their message. You are not bound by any stereotyped or antiquated notions. What is being done in Europe or America, or what has been done in India in the past, or what is being done in the present, need not be any rule to you, unless you can see it is calculated to gain the end you have in view. Go, my comrades, and pray and look about you, and thus acquaint yourselves with Indian modes of thought and feeling and action, and then adapt yourselves to them, so far as such adaptation shall be consistent with the doctrines of the Bible and the principles of the Army (Quoted in Booth-Tucker 1924:xix). In fairness it must be said that there has always been a tension between the desire to adapt to the uniqueness of a given cultural context and the requirement of loyalty to what Edward Higgins, then Chief of the Staff, called the Army's 'distinctive features of service and method.' Acknowledging that some cultures proved less than receptive of the Army's style of ministry, he took comfort in reporting, "Our pioneer officers have fearlessly and confidently pressed upon the people the Army's aims, principles, and methods, and invariably -- sometimes in a less and sometimes a greater degree -- there has been a most striking response" (1929). That tension is still significant in seeking to relate to changing cultural realities within cultures, in the West as much as other parts of the world. 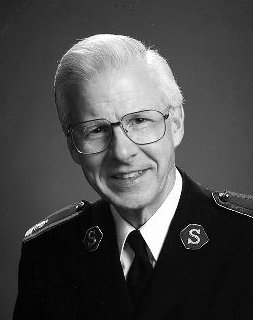 Believing that the Army's identity and principles are transferable to other cultural settings Salvationists seek to maintain what might be regarded as the essentials of Salvationism that have sustained its mission across time and cultures. The task is to discern what those essentials are! To some degree virtually every denomination struggles with these issues. The tension is exacerbated by one of the Army's most highly valued distinctives: its commitment to internationalism. Every expression of the Army in all of the 117 countries where the Army has a legal presence is bound to the international movement and subject to the direction of International Headquarters under the authority of the General. The connection is organic, structural, administrative, cultural, legal, and most importantly, covenantal. Booth called for 'one Salvation Army' -- "one body with the same head, the same government, the same laws, and substantially the same usages and methods . . . . There will not only be the liberty, but the necessity, to adapt its methods, so far as is consistent with truth and righteousness, to the character and habits of the people, the Salvation of whom it is there to bring about (1887:51). The structural unity of the Army internationally has made it an anomaly to ecumenical bodies. It doesn't fit the model. Membership is usually limited to national church bodies. In the end, the Army has assumed an observer status in the World Council of Churches along with the Roman Catholic observers. However, the Army in certain countries, has maintained membership in national Christian Councils, even though it is not appropriate to regard The Salvation Army functioning in any nation as an autonomous national body, as, for example, the Korean Presbyterian Church. This applies whether or not the Army in that nation is financially independent or has no western international reinforcement officers serving within the 'territory.' India, Korea, Japan and Indonesia, for example, currently have no western expatriate officers resident in these countries. The work is entirely indigenous. Indeed, these territories and others are contributing officer personnel to other parts of the Army world. The exchange of officer and professional personnel between countries East to West, South to North as well as West to East and North to South has greatly strengthened the unity and effective internationalism of the movement. More than ever before, the Army world is 'flat' (Tom Friedman). Born in 1934, the 15th General was the first American General. Rader's studies at Asbury College, Asbury Theological Seminary and Southern Baptist Seminary resulted in BA, BD and MTh degrees. He later received a Doctor of Missiology degree from Fuller Theological Seminary School of World Mission. He served variously in pastoral, missionary, training and administrative positions in the United States and Korea. It was early Sunday morning when Igor, our Russian-speaking guide and translator, greeted us in the hotel lobby. We had a 2-½ hour drive ahead of us and wanted to be on time for the Holiness Meeting in Seda, a village located on a snowy rural road a small distance from a major thoroughfare in northeast Latvia. As we took our seats in our Toyota Corolla van Igor remarked how strange it felt to have the driver seated on the right and appeared a bit apprehensive as we set off. (Traffic in Latvia drives on the right and which I handle well, Glad however doesn’t and therefore does little driving outside the UK) To make certain we didn’t get lost in the wintry wilderness Lt. Peter Baronowsky had loaned us his satnav which included every SA destination in Latvia and more, a unofficial road map of Latvia (vintage unknown) and his own hand written cartography detailing where in the village the unmarked SA was located including the color of the houses and the make and model of the Corps Officers automobile. Peter shared ‘it will probably be the only car in the village’. The satnav was programmed in Sweden and consequently gave directions in Swedish, Igor seated behind me gave directions in Russian and English and Glad prayed! We all took credit for arriving some ten minutes before the meeting began. As we stepped out of the car both Captain Sergei and his wife, 2nd year Cadet, Aizan Konovs came bounding out of the side door of the building through the deep snow and bid us welcome. The Captain’s wife Aizan can only be described as the epitome of the joy filled Salvationist Officer. No interpreter was needed to translate the joy and exuberance of spirit expressed by the Cadet. We were brought into the small hall were every seat was taken and then led into a smaller part of the building where the Sunday School was meeting. We were treated to coffee, tea and cookies and introduced the children and Senior Soldiers. Among the children were the twins Signe and Sogne, wheelchair bound due a series of back operations her mother told us that they wont know if the latest operation was successful until rehab has begun; there is no assurance that the government can provide such assistance any time soon. We heard the strumming of a guitar and soon the strains of ‘As the Deer’ being played expertly by Captain Sergei, and so we were led back to the main meeting room where a bench had been carried in for us to sit on. As I looked around I noted that many people were sharing a chair seat or stool with others, some 28 or so in total. Throughout the service more adults and children squeezed in. It was an interesting mix of people consisting of some quite elderly, many in their mid years and also young families; a few of the men seemed a bit worse for wear. All followed the progress of the meeting with great interest, some perhaps because they knew it would be followed by a delicious hot meal. Two years ago no one in this remote part of Latvia had ever heard of The Salvation Army. And, had they taken the time to Google TSA in Russian they would have learned that The Salvation Army was a branch of the USA; Central Intelligence Agency, or, a western (cult) created to infiltrate the former Soviet Union during the confused era following perestroika. This area of the former SU, however, had learned the truth about the army’s mission. The Salvation Army pays no rent for the meeting rooms provided them by the local government, their only cost is in paying for the heat in the space provided them. In two months the health clinic that occupies the majority of the well kept and centrally located building will move to new quarters and the entire building will be provided for the free use of the SA outpost. Meetings are held twice weekly and social services are offered as well. A husband and father, a well known local criminal in town, began attending meetings shortly after the Army’s arrival. He had been arrested, charged and convicted of a crime and was awaiting sentencing. During that time both he and his wife were saved; she is now a soldier. When the day of sentencing came the Corps Officers accompanied ‘Andre’ to the trial sentencing requesting the opportunity to speak to the court on his behalf. The judge heard the story of Andre’s conversion and positive new lifestyle and decided to, instead of sending him back to prison, to release him to the custody of the local Salvation Army. The impact that these officer heroes are having in this small part of Latvia is remarkable and speaks to their commitment and God’s faithfulness. A key element in the morning meeting was the enrollment of three more recruits adding to the already impressive number. We shared with the Captain that we had delivered 47 uniforms to regional Headquarters in Riga he joked and said we are having a bit of a revival as you can see. Is there any chance half of them can be delivered to us?! From what we witnessed the Captain may well be prophetic. God bless The Salvation Army in Seda! The Latvian headline read; Latvian pedestrian with twice lethal alcohol level killed by car while he lay in a drunken stupor on the roadside. My mind immediately raced to Sakarny. Sakarny is the site of former Soviet military barracks abandoned in 1991 when the Russians recalled all troops subsequent to Latvia’s independence. The Latvian government adapted the barracks for use, copying a Russian model where all possible social ills are hidden from view. During Soviet times in Russia the sight impaired, deaf, and physically challenged persons were all relegated to infirmaries and institutions hidden far from cities and towns. It was the government’s clumsy attempt at hiding a less than perfect Soviet citizen, often claiming to a doubting ‘west’ that there is no missing chapter dealing with their disability history. Some visitors to our blog may recall that during the 1980 Olympic games in Moscow, a Western journalist inquired whether the Soviet Union would participate in the first Paralympic games, scheduled to take place in Great Britain later that year. The reply from a Soviet representative was swift, firm, and puzzling: "There are no invalids in the USSR!" (Fefelov 1986).1 This apparatchik's denial of the very existence of citizens with disabilities encapsulated the politics of exclusion and social distancing that characterized disability policy under state socialism. Historically throughout the former Soviet bloc, persons with physical and mental disabilities have been stigmatized, hidden from the public, and thus made seemingly invisible (Dunn and Dunn 1989). In Sakarny Latvian alcoholic families are hidden away from public view and their dependence distanced from the reality of Latvian society. Some thirty families many with children are housed in unheated flats with only the basic necessary pieces of furniture. There is no running water or plumbing of any kind. A tractor brings logs from the nearby forest to be used to heat the very crude make-shift furnaces. Many of the adults can’t be bothered to make the effort to collect the logs and heat their flats so the children suffer while their parents remain in a drunken stupor. There are no shops in the settlement of six barracks, and the only items for consumption sold is bootleg liquor sold by traffickers. The children, some as young as 6 and 7, become unwitting enablers in the attempts to protect their parents as best as possible. This includes carrying them in from sub zero temperatures, cooking, and feeding them and cleaning the messes their parents make. They shield their parents’ addictions from their friends by never inviting them to visit. Such behaviors are referred to as codependence. Sakarny has been an area of particular interest to the FSAOF since we first learned of the children’s plight. This included the need for warm winter clothing and financial support to provide school lunches. Both challenges were met and we were anxious to visit first hand to see what had transpired. We arrived in Sakarny in our Toyota van following the Corps leaders in their Ford station wagon on a sunny Sunday, with the temperature hovering at -10. From a distance we could see the children playing in the snow. Even in the sub zero temperature it was a more desirable place to be than in the flats watching their parents in various degrees of drunkenness. However, they were comfortably dressed and warm thanks to the kindness of a great many people not least, those in Exeter who responded to the articles in the Express and Echo. When the children spied the familiar SA station wagon they all came running waving and shouting their hellos. The Captain and his wife are more than pastors to them, they are their surrogate parents. Some of the children have been moved to nearby Skangali, a SA children’s home where they reside Monday – Friday under a special judicial ruling allowing the SA to make legal arrangements directly with the parents as to the care of the children. The Sakarny children who live with the orphans during week are jokingly referred to as missionaries as they constantly talk about Jesus, with the 23 orphans housed there. The childrens home operates a pre school programme three times a week from 9-1 where the children are provided two meals and a warm shower. One of the young girls was presented with soap and shampoo as she emtered the shower- on exiting the shower some minutes later it was noticed that neither the soap or the shampoo had been used; she had no idea what they were to be used for! The children, who knew nothing of Glad and me hugged us warmly as if we were their family, no doubt due our uniforms with which they would be familiar. The oldest girl had all the children line up in a row as if they were siblings and named each of them for us. We then asked if we could take their photo and they promptly took their places. Then, out came ‘Babushka’ (grandmother), the mother of one of the alcoholics and who assists in caring for all of the children when they join in the Army activities arranged for them in the two rooms allocated by the local government for our use. (The SA will soon be provided additional space and it is our intent to take a work team to Sakarny in the summer of 2010 to renovate some of the flats in which the families live along with designated SA facilities. When it came time to leave one of the boys threw himself on the ground in front of our car and the others joined in and there was soon a pile of children letting us know they didn’t want us to leave. The joy on their faces was infectious and their spirits exuded love and affection, the result of constant contact with their Christian ‘parents’. One of the young girls asked if she could pray with us before we left and, of course, we said ‘yes’. Her prayer was not (from what I understood from my limited knowledge of the Russian language) one asking for a better life, heat and comfort, regular meals … She thanked God for these visitors who had come and for all those others who had assisted in providing warm clothing and who had guaranteed that there would be a lunch served every day in school … and then she closed with a lengthy petition that God would grant Glad and Sven travelling mercies; roads clear of snow, a warm bed and smooth seas! The army's presence and Christ's imprint on their young lives were unmistakable ! Those words seemed uniquely apt and could well be applied to each of the one hundred and seventy five 'homeless' persons who met to worship for three hours today at The Salvation Army Riga II Corps, Latvia. The service in the capital of Latvia was conducted entirely in the Russian language which is the mother tongue of more than 30% of the Latvian population. These are a people living in exile, a diaspora population abandoned by both their country of origin and the country where they were born, raised and reside. Subsequent to the Russian invasion of the Baltic states 100's of thousands of Russians were transported to every corner of Latvia and the other conquered nations to indoctrinate the people in ways Russian. Now, some six decades later and following perestrokia, the people are second and third generation Latvians without any rights. They have no possibility to gain citizenship in Latvia, and their homeland Russia, don't want them either as they would only add to the unemployment and social problems already so prevalent in Russia. They are a people without a country and without a home. The majority are unemployed and are on a constant search for a place to rest their head each and every night. The most recently enrolled soldier shared that he sleeps in the trolley station during the day but when the doors are locked at 8.00pm he wonders the streets in sub zero weather until dawn and then repeats the process. Today however, he moved into a flat with four other recently enrolled soldiers a stones throw away from the Corps were he and his colleagues spend all their time assisting the CO in providing social services. The costs are assumed by salvatio9nist griends in the 'west'. Ought this become a FSAOF project ? The hopes of these worshippers are not for a middle class life or to auto ownership or vacations abroad. Their hope is simple just one more hot meal, a warm place, and a loving heart and listening ear; they have found them. Were you to visit their worship service you would find that pungent smell so familiar to every SA Officer from days working with the homeless that visited your Corps or institution. These are the people Jesus said we ought to 'see as better than yourself". These are the people for whom Jesus died to give hope and erase anguish. Had only one of these downtrodden souls ever lived Jesus would have come for them. And He comes yet today thanks to the selfless loving embrace extended by these Salvationist heroes. The singing was electric - the prayers moved us to Heaven - the testimonies gripping - the preaching powerful and compelling; resulting in queues waiting to kneel at the mercy seat. It was the Army at its most authentic and I was humbled to think that God has a place in it for you and me. Tomorrow we set of to see the children for whom you and all in our fellowship provided winter clothing and funding for their school meals through the end of the school year. We will bring greetings on behalf of you all as I know you lft up our Salvationist comrades in Latvia in prayer. 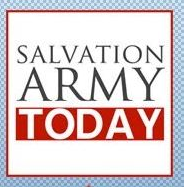 "GENERAL Shaw Clifton is pleased to announce that the work of The Salvation Army has been officially established in the west African country of Sierra Leone, bringing the total number of countries in which the Army operates to 119. An enquiry was first made as to the possibility of The Salvation Army establishing a presence in Sierra Leone in 2003. That led to a long period of discussion, prayerful consideration, careful research and waiting upon the Lord to reveal his will in this regard. Further enquiries came in 2005 and then, in 2006, Auburn Corps in the Australia Eastern Territory expressed a keen desire to support any project the Army might consider running in Sierra Leone."